Vertex has been in the Japanese automotive performance industry since 1996. Vertex strives incorporate technically advanced manufacturing with elegance in all of their products. All Vertex Aero kits are inspired by the vehicles factory body lines. Vertex strives to make their body kits aggressive yet at the same time simple. The goal is to create a subtle design to compliment the cars original form. No design is ever overdone, yet it still customizes the look of the car to enhance the vehicle from its factory form. Vertex’s founder, Takahiro Ueno, is a passionate driving enthusiast, and is a long time enthusiast of rear wheel drive Japanese cars such as the Lexus SC300/400. Because of this, Mr. Ueno remains true to his street racing roots, allowing his passion to show in his company and his products. He has competed in the D1 Grand Prix drift circuit with his Lexus SC. Vertex is dedicated to offering quality parts to their customers that they will enjoy for a lifetime. 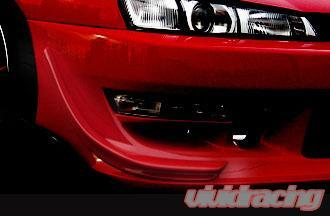 Vertex canards affix to the front bumper to direct air flow and enhance styling. Vertex Front Bumper Canards are the perfect answer to aerodynamically tune the handling for the front of a car. 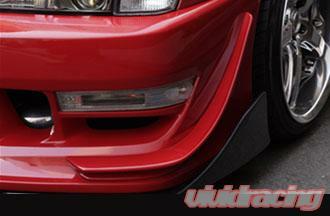 Vertex Front Bumper Canards help increase front down force at high speeds. The added down force stabilizes the cars chassis during hard cornering and increases traction for faster lap times. Front canards give your vehicle unique flair and more aggressive styling. For over 25 years, Vertex has built its business on successful, long-term relationships with our clients. Our commitment to a quality product, prompt and efficient service, as well as our extensive product knowledge and technical expertise has made us the Porsche parts industry leader. Whether you are restoring, rebuilding, maintaining or upgrading your Porsche, Vertex Automotive has all the Porsche parts and accessories you'll need.